When you, a friend, or a loved one is diagnosed with a terminal illness, a process is begun: the process of preparing for death. For many, this time of preparation can be transformed into a rewarding, comforting ending, giving meaning to life, and dignity to death. Preparing for the practical issues. Making contact with loved ones. The first thing to do upon realizing death is in the imminent future, is to sweep away the practical considerations, making plans for death early, freeing yourself from later labor and stress. This is a time for finalizing a will, laying out a living will, describing your wishes for burial or memorial ceremonies, and making clear how you want your remains to be dealt with. Lining up doctors, hospice care, possible in-home nursing, sorting out issues of insurance – these are all things to deal with early, rather than later on in the progression of the disease. Many people find the process freeing. In relieving themselves of tasks while they are still some distance from death, they ensure that as death approaches they can concentrate on love and relationships, and on transforming the process of death into as vital an element of life as any other precious, rare occurrence. Some people find having a counselor helps them, and in some cases their close family, deal with grief, loss, and regrets, restricting the amount of fear and anger that is involved in passing. For those who approach their death with this attitude, the process can be a special, loving chance to make a final connection with family, friends, and associates, and even to make peace with old rivals and enemies. Guidance and help can be invaluable at this time: in a culture as uneasy with death as ours, the support and acceptance of a trained minister, counselor or coach can help those involved with the dying accept their own role in the resolution of a life. Death counseling, crisis counseling, and hospice counseling: these are specialized fields, and many of the individuals involved in this work are exceptional in their skill and their compassion. Working with and for the dying person and those who will survive, a counselor can serve as moderator, comforter, and source of support and information, leaving the family as free as the dying to accept the tides of feeling and reaction without constant pressure to cope with everyday realities. For many, both among the dying and those who will mourn them, death is a time to invest in the future: to ensure one last gift to life, before death. Planning together the ways that gift will be given can provide structure, support, love, and ensure some form of hope that can carry the living –and perhaps even the dying – on past the moment of death, easing transition and enriching grief with grace and dignity. We are a culture no longer used to coping with illness. As a result, few are prepared for the physical stress of a terminal disease, or the many complications of caring for a terminally ill person. Getting support and advice from your medical providers, and further recommendations from experienced counseling staff, can ease the difficulty. Taking advantage of the practical knowledge of those who deal with illness regularly can help the patient and his immediate circle of friends and family cope with medications, physical limitations, and more. 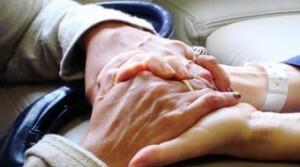 To arrange for such help, early contact and secure arrangements with all levels of care provider are an excellent idea. Beginning early relationships with supporting care givers can be established long before the need is critical, and a caregiver can function as an accepted and comfortable member of the community gathered around the terminally ill as the disease progresses and greater support is needed.